Hello all and happy July 29th! 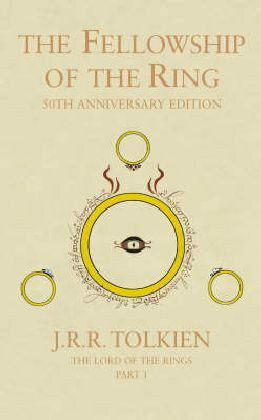 Or, as its known to many fantasy and sci-fi geeks, the day that The Fellowship of the Ring the first volume in the LOTR trilogy was published in 1954. Yes, I learned that just this morning, and thought it was the perfect excuse to finally do the review I’ve been putting off until now. I can only apologize for my negligence in this regard, but let’s face it, this book is kind of a big deal. With this trilogy, Tolkien effectively did for fantasy what Herbert would later do for sci-fi with Dune; that is to say, make people take it seriously. And even if you’re not a fan of fantasy, you have to acknowledge the incredible debt owed to Tolkien. Not only did he provide a legitimate injection of mythos to the fantasy genre, establish a very real connection between ancient and modern, and provide archetypes which are still used to this very day. On top of all that, Tolkien gave the British people a sense of cultural lore that was all their own, which was precisely what he wanted. In fact, Tolkien went so far as to say that his motivation in writing “faerie story” was to create a narrative which he felt had been previously missing in British culture. When one looks at ancient mythology, be it Norse, Greek, Roman, Native American or Indo-Aryan, one sees stories and legends that are tied to a culture and contain incredible power for its people. And while the British have their share, Arthurian myth for example, Tolkien felt that this smacked of a Judea-Christian prejudice and did not genuinely reflect the British temperament. But of course, many literary critics went a step further and claimed that his books contained allegorical similarities to the conflict which had just passed in Europe. 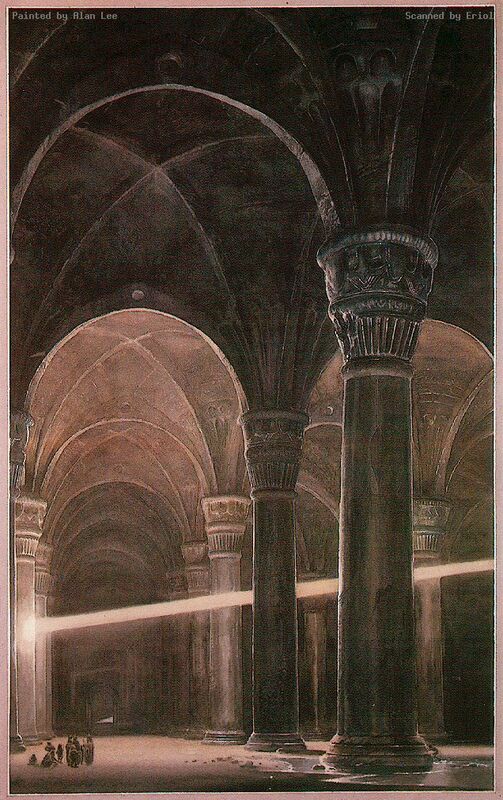 Though he began work on his voluminous masterpiece before the war began, much of it was completed during the war years and seemed to possess veiled references to the conflict. Think about it, the nations of Middle Earth (which included the “Men of the West”) were faced with a resurgent evil that came from the East. The last time they faced it they had been successful, but the unsatisfactory conclusion of that conflict paved the way for a future war. Now, with the evil returning, the nations of Middle Earth found themselves in a weakened posture, but managed to succeed by comign together once more to thwart the evil, this time destroying it permanently. 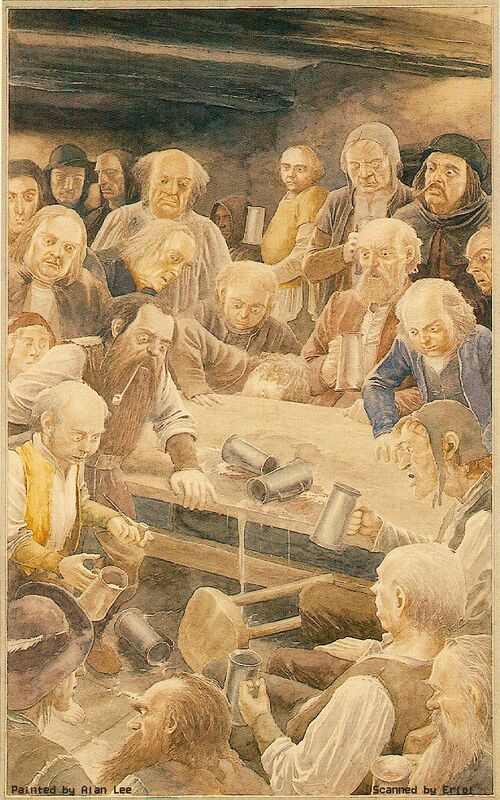 Hell, even the races of Middle Earth themselves could be said to be allegories for real nations – the Elves, Dwarfs and Men constituting the British, French and Americans respectively, while Hobbits were unmistakable representations of the British folk, the hardy little people who made all the difference. But that is mostly speculation. In the end, Lord of the Rings is so richly detailed and deep that people have been able to discern countless metaphors, allegories and significant passages. In the end, it’s genius lies in the fact that it was both hugely inspired yet immensely original. So without further ado, let’s get down to dissecting the bad boy that started this whole phenomena! Sidenote: the focus of this review will be the novel itself. Any notes on the movie adaptation come at the end, so don’t expect a running commentary on how the book differed from the movie. 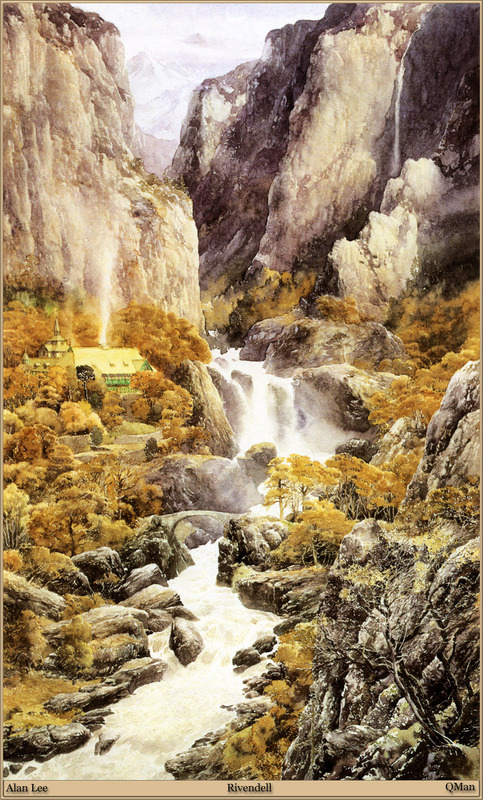 All artwork provided is that of Alan Lee, the illustrious illustrator of Tolkien’s work. The book opens with a note on Hobbits and a preamble indicating what took place in the previous book, The Hobbit. 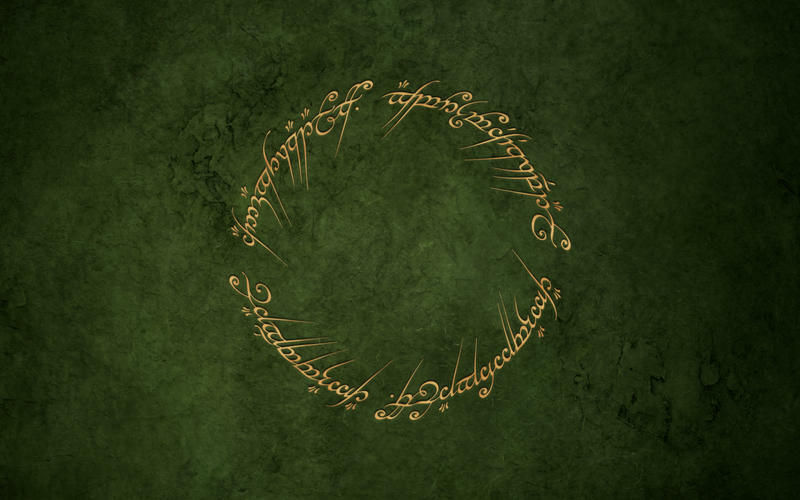 It also provides some deep background which includes notes on the people of the Shire, their customs, and how Bilbo Baggins came into possession of the One Ring. The story then opens with book I, the first in the six book volume that makes up the single tale of The Lord of the Rings. In the first chapter, the story returns us to the Shire where Bilbo is waiting up his 111th (or eleventy-first) birthday, while his adopted heir Frodo is coming of age at 33. Bilbo is sparing no expense for the occasion and has even invited Gandalf to attend, as he has some rather important news for him. This, Gandalf soon learns, is that he intends to take a permanent holiday. He plans to leave everything to Frodo, but doesn’t seem to want to surrender his one prized possession: The One Ring. After a tense confrontation with Gandalf, who convinces to leave the Ring behind, Bilbo departs on his journey and the two promise to meet up again. When Frodo arrives at Bilbo’s house, he is ransacked by relatives who are looking for their share of Bilbo’s wealth. After they all depart, Frodo is spoken to by Gandalf, during which time he tells him he plans to depart on his own business. He warns Frodo to keep a close watch on the Ring, as he fears the worst of it. Over the course of the next 17 years, he pops in to visit Frodo, and eventually comes to tell him the truth. The Ring, he claims, the One Ring forged by the Dark Lord Sauron to help him conquer Middle Earth. This provides some additional background on the story, where Gandalf explains to Frodo all about the “War of the Last Alliance”, how Isildur took the Ring for himself, and how it fell from his posession to be lost for ages. He also explains how, in time, Bilbo found the Ring in a cave where a forlorn creature named Gollum had been living with it for centuries. 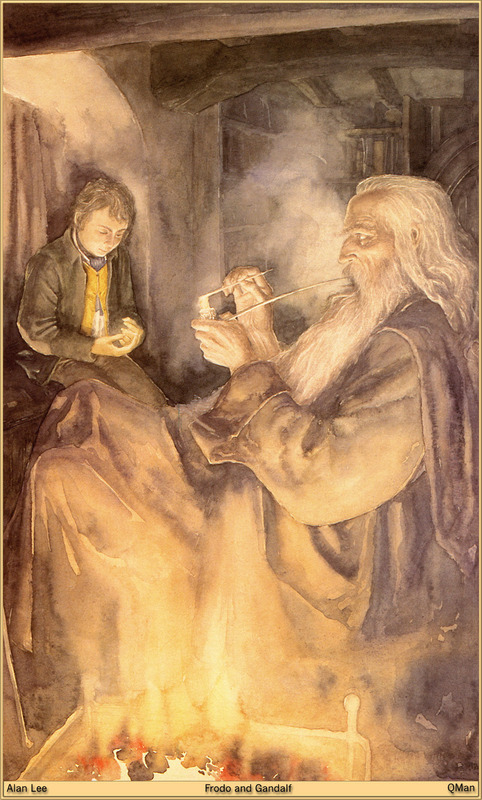 It was this Ring that bestowed Bilbo’s legendary longevity, as it did Gollum while simultaneously poisoning his mind. He comes at last to the point of the tale: Sauron has risen once again and is gathering his strength at Mordor. But before he can complete his conquest of Middle Earth, he needs the One Ring to which he is bound. Already, his forces found Gollum and learned from him that the Ring was in the Shire, in the possession of one named Baggins. Because of this, Frodo must leave and go to Rivendell, where he will be safe and the fate of the Ring can be determined. Gandalf must set out on his own too, to consult with the head of his order Saruman at Isengard. He promises to meet up with Frodo again before the summer when Frodo will depart. Frodo’s friend and gardner, Samwise Gamgee, is found overhearing their conversation, and out of loyalty to Frodo, agrees to go with him. When the summer arrives, Gandalf does not show, but Frodo must leave and does so under the pretense that he is moving, and with the help of Meriadoc Brandybuck and Peregrine Took, they set out for the edge of the Shire. Along the way, they hear of Black Riders that have come to the Shire and are asking after a Baggins. These are revealed to be the Nazgul (or Ringwraiths), “the most terrible servants of the Dark Lord”. With the help of a party of Elves and the Farmer Maggot, Frodo and his company reach the edge of the Shire and pass into the wilderness. Along the way, they meet more curious folk, such as Tom Bombadil, a strange Hobbit-like creature who seems to be immune to the Ring’s effects. At last, they come to the town of Bree, where they take a temporary respite at the Inn of the Prancing Pony. After downing a few pints with the locals, Frodo accidentally reveals the Ring when he slips it on and disappears from sight. He is then pulled into a room by Aragorn, who reveals himself to be a friend of Gandalf’s and a friend in their quest. He shows them the sword of Elendil, the shattered remains of the blade that cut the ring from Sauron’s hand, and agrees to take them the rest of the way to Rivendell. After several days of traveling through the wilderness, they come to the ruins on the hill of Weathertop. During the night, they are set upon by the Nazgul, and after cornering Frodo, the chief stabs him with a cursed blade. Aragorn manages to chase them off, but warns that Frodo must get to Rivendell with all haste, or he will become a Nazgul himself. As they hurry along, they meet Glorfindel, an Elf warrior from Rivendell who agrees to takeFrodo there with all haste. 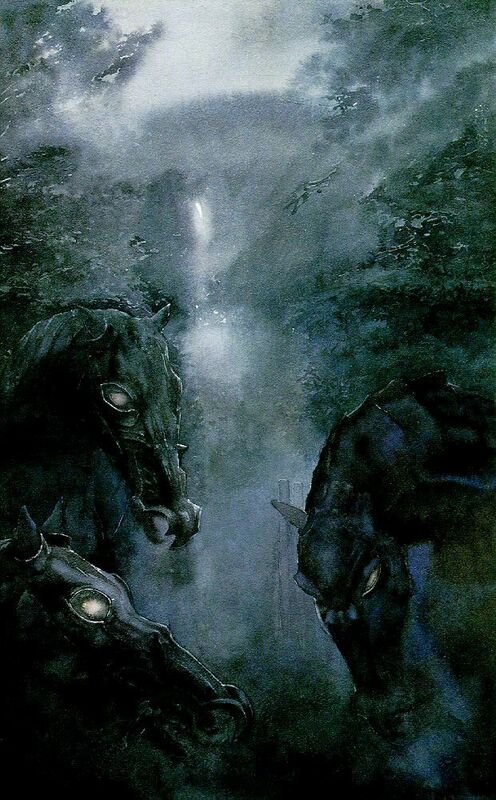 The Nazgul, all nine of them joined together now, pursue them and attempt to follow them across the Ford of Brunien, the last remaining obstacle between Rivendell and the outside world. However, Elrond sends a wave down the river which smashes the Nazgul into the rocks and ensures Glorfindel’s and Frodo’s escape. However, Frodo collapses and appears to be near death. When Frodo awakens, he learns that he is in the House of Elrond in Rivendell, where he has been healed by Elvish magic. Elrond summons the Council which consists of Aragorn and representative of every race on Middle Earth. Frodo is invited to attend, where he presents the One Ring. Gandalf is there too, and explains that he was held up because of a betrayal. Saruman, head of his order, has apparently betrayed them because he desires the Ring for himself. He is not yet in the service of Sauron, and is amassing his own army of Orcs. Together, they hatch the plan that the only way to defeat Sauron is to destroy the One Ring, which must be cast back into the fires of Mount Doom from which it was forged. Frodo volunteers to take the ring and thus becomes the Ring-Bearer, and Samwise once again vows to stay by his side. Completing the Fellowship are Aragorn and Boromir, son of the Steward of Gondor; Legolas, Prince of the Silvan Elves of Mirkwood; Gandalf; Gimli the Dwarf; and Merry and Pippin. Together, they set out south along the Misty Mountain route. However, there attempts to cross are foiled due to snow and avalanches. They debate over what to do next, but it is agreed that they will pass through the mines of Moria instead. Aragorn seems to think this is a risky idea, but Gimli insists that his cousin Balin who rules there will give them safe passage and hospitality. Once inside, they find the place littered with corpses and overrun by Orcs. Their company finds their way into a side room where Balin’s tomb is located, and where the Dwarves apparently made their last stand. Shortly therafter, the Orcs fall upon them and the company manages to make its way out. However, when they reach deeper into the mines and come upon a bridge leading to the surface, an even greater threat emerges: A Balrog of Morgoth, a creation of darkness and flame from the ancient world. Gandalf stands against it, but soon finds himself pulled down into an abyss with it. Frodo and the rest of the Fellowship look on in horror, but are forced to flee as more Orcs swarm in to attack them. They make their way out of the mines and Aragorn laments that Gandalf didn’t heed his warnings about passing into the mines. 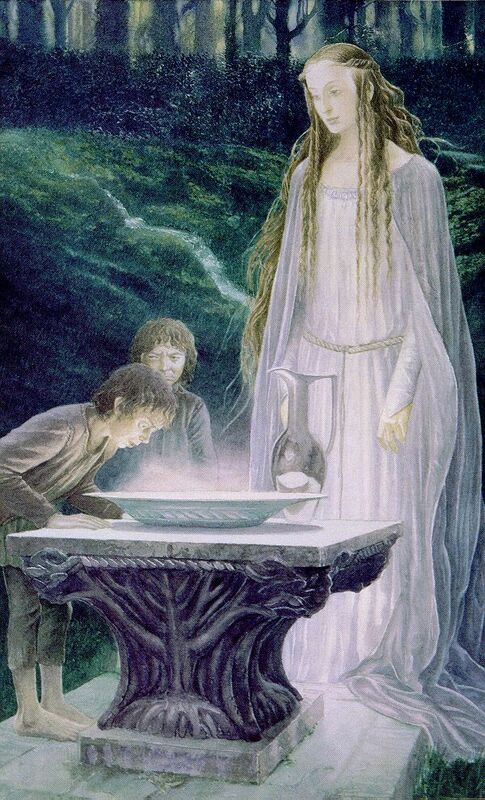 For a long time now, it was feared that the Dwarves lust for Mithril (which was mined in Moria) caused them to dig too deep and disturb what lay down below. Once free of the mountain, they make for the elf-haven of Lothlórien, where they are sheltered by the rulers Celeborn and Galadriel. As they take their rest, Galadriel speeks to Frodo and provides him with visions of what is to come. He offers her the Ring, which she considers momentarily, but then rejects. The quest falls to Frodo himself, he is told, and he must find a way to destroy it. Before setting out down river, they are given provisions and items for their quest, all of which will prove useful later on. After setting down at water’s edge, the Fellowship begins to show cracks. After days of becoming edgier and moodier, Boromir finally confronts Frodo and tries to take the Ring from him. Frodo places the Ring on and escapes, and the others scatters to go and hunt for him. Frodo decides that the Fellowship has to be broken, and that he must depart secretly for Mordor. However, Sam finds him before he can leave and insists on coming with him. The two then set off again down river, just as a company of Orcs close in and threaten the camp! Thus ends the first volume of the Lord of The Rings! Of the three books, I have to declare right off that this was my least favorite. But of course, that isn’t saying much given how impressed I was with book II and III. Nevertheless, I couldn’t help but feel that with this first volume, Tolkien wrote long-winded passages that really weren’t necessary. Of course I could see the point of them. They established background information and detailed the fictitious world in which the events took place. Nevertheless, so much of Book I felt like interjections and asides that didn’t seem to contribute to the overall storyline. For example, Tom Bombadil’s role in the story has long been a subject of debate. As it was explained to me, he occupies the same category as the Ents and other mythical creatures, in that he is outside the regular events of the story. Whereas the Ents are indifferent to the Ring and the wars for Middle Earth because they are so old, he is also indifferent because the Ring has no power to sway him as it does other creatures. But in the case of the Ents, they came to be directly involved in the war because they realized that they could not simply sit idly by and let things pass. Tom had no such compulsions or involvement, and aside from being mentioned briefly in Rivendell, has no more role in the story. And unlike certain features which come up during the long journey through the Wilderness, his inclusion also wasn’t a shout out to content from the Hobbit. So really, what purpose did he truly serve? Second, there was the Fellowship’s journey through the Misty Mountains. It is implied that they are turned back by Saruman’s magic, but it is never established. What’s more, the dangers of going through Moria are hinted at ahead of time, but it appears Gandalf is okay with the idea even though he must have foreseen he would be the one to die. But in the end, it is Aragorn who later laments the decision and questions why Gandalf would be okay with it. It seemed to me that if Moria represented the riskiest choice, Gandalf should have been the one had doubts about it. Last, there was the point at which the Fellowship breaks. In book I, we see the basic points, Boromir trying to steal the ring, and Frodo leaving with Sam before they Orc party strikes. But it’s not until book II that we realize that such a confrontation took place, that Boromir was killed, or that Merry and Pippin were taken prisoner. In this, and all other cases mentioned, the movie sought to show these things and explain them fully. Quite predictable, but in the case of this first story, I actually felt it worked. But of course that probably has something to do with the fact that this one time I saw the movie first. Were I a Rings geek prior to the first film (as I was for II and III), I might have taken issue with all these changes instead of approving of them. So far, I feel I’ve been saying only negative things about this book. But let me be clear, it’s only because the story set such a high tone that I was surprised to find that there were any weaknesses at all in this volume. If anything, the flaws are the exception to the rule, which is that Tolkien managed to create a story and and entire world steeped in legend, lore and magic. His main characters are archetypical legends, calling to mind such heroes as Beowulf, Arthur, Lancelot and Merlin, and whose supporting characters call to mind the same kind of comic and tragic figures as Caliban, Launcelot Gobo, and King Lear’s Fool. And of course, there are the legendary races in the story which continue to dominate the fantasy genre and popular consciousness alike. When it comes to stories, gaming, movies and television, the basic breakdown of Elves, Men, Dwarves, Orcs, Ogres, Goblins, Wizards and Dark Lords is still in effect. Willow was a movie built entirely on Tolkien’s foundation, Chronicles of Narnia, Harry Potter and The Golden Compass owed a huge debt to his work, and Warhammer, Dungeons and Dragons, and countless other games I can’t even name wouldn’t exist without him. And the storyline itself is nothing short of genius. Embracing such themes as the “Decline of the West”, the rise of an old evil, the idyllic countryside, the world outside your door, and little people caught in a situation much bigger than themselves, the story was so layered that people could find no shortage of significance and meaning contained within. It’s little wonder then why it has remained so influential and enduringly popular! The Future is Here: Robotaxis and Podcars! Well done and I didn’t realize this was the anniversary of the publication. Cool. Great synopsis! Tokien’s works really were brilliant. So much details, history, even written languages, poetry, and art. And it inspired other writers later on to create their own epic universes – I’m thinking of Star Trek, Star Wars, and you listed out a bunch of them too!